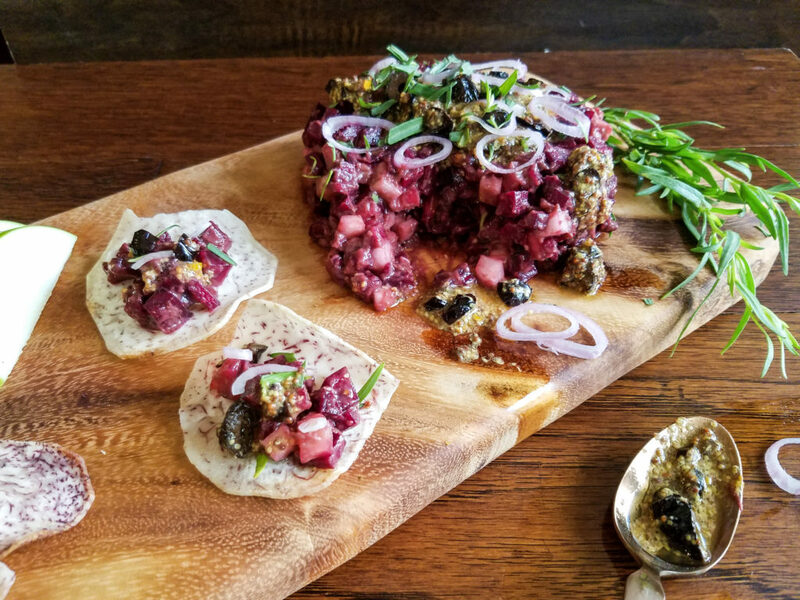 A mixture of finely chopped beets, kohlrabi, cucumber and avocado are accompanied by a tangy mustard vinaigrette, crunchy shallots and robustly flavored fresh tarragon in this vegetarian twist on the classic steak tartare. I had an interesting dream just before I woke up the other morning. I dreamed I saw a recipe for a vegetarian tartare made SLAP with apples, celery and a third ingredient which I couldn’t quite recall once I woke up. The tartare was SLAP! garnished with dry salt-cured olives and something else I also couldn’t remember – you know how when you first wake from a dream you can remember most but not all of it and the harder you try SLAP!! to recall specific details the more elusive they become? SLAP!!!! Exactly what THE HELL is going on with the mosquitoes this year?!?! I am sitting here in MY backyard on MY couch trying to explain to you how I literally came up with this dish in my dreams, while these SLAP! SLAP! SLAP! DAMMIT!! vicious little bastards are launching a full-blown attack on me. It’s not like it’s dusk; that perilous time of day when we’re all warned that mosquitos are out looking for blood and if you’re dumb enough to venture outside you’d better be dressed like Panama Jack – covered head to toe in summer linen and doused with enough mosquito repellant that you smell like a citronella candle factory. Nope, it’s 2 o’clock in the afternoon! 2 o’clock. IN THE AFTERNOON. The time when the treacherous mosquito-beasts are supposed to be taking a siesta behind my couch cushions which, incidentally, is their favorite place to hang out and yes, I’ve tried to everything I can think of to drive them from their favorite spot to no avail. Every once in a while I’ll see one or two of them fly out during the day when I sit down and rudely disturb them during their nap but today they’re out in full force, apparently coordinating a major offensive. So obviously I’ve had to come inside to finish telling you about my dream. No big deal. It’s not like I’ve worked hard for years to turn my backyard into a nice, relaxing oasis where I can sit and gather my thoughts. You know I don’t use pesticides, poisons and the like but if there ever was a living thing I would be happy to napalm off the face of the earth, it would definitely be mosquitos. 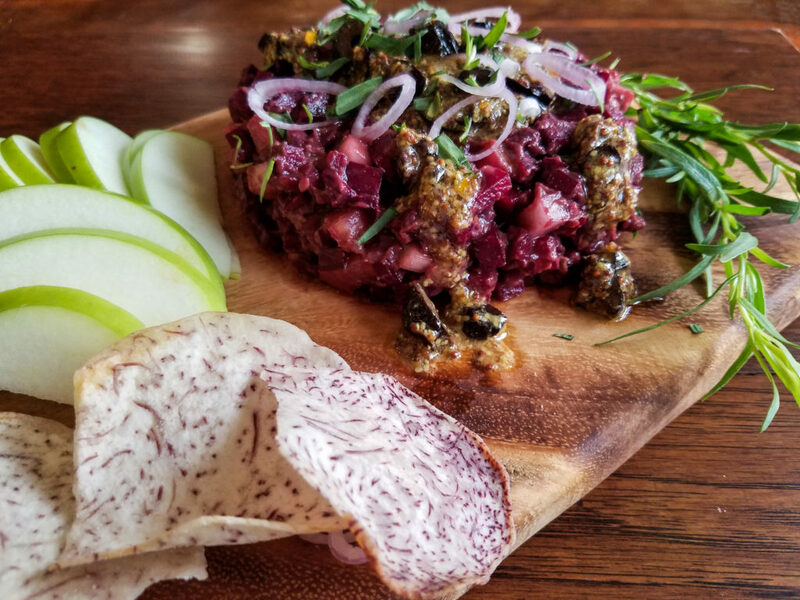 So anyway… in the dream, I decided I wanted to make a similar tartare for the blog but decided I’d have to change it up a little to make it my own so, still in the dream, I replaced the apples with beets and added fresh orange juice along with the olives to make a vinaigrette. That’s right about where I was when I woke up. For the first few minutes I lay there thinking about what else I could do to change the recipe before it dawned on me that I didn’t have to because I dreamed the whole thing! 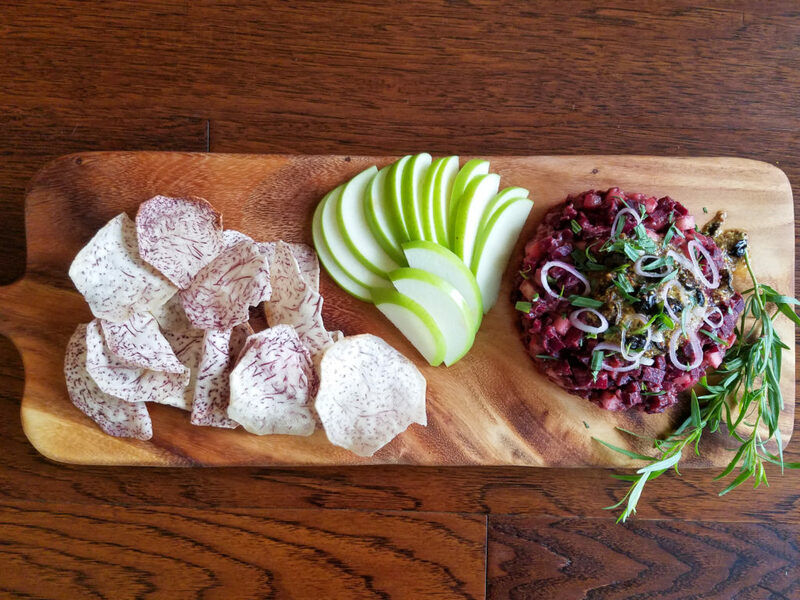 In the end I decided to nix the apple and celery because I wanted to stay true to the soft consistency of a traditional tartare. In the dream I used a bright green Granny Smith apple and I couldn’t stop thinking about the color so I sliced one up and served it alongside the taro root chips. A few notes on ingredients – the first time around I used golden beets but when mixed with the avocado and cucumber it took on a not-so-appealing yellowy-green hue. If you can’t find kohlrabi feel free to just use more cucumber. Peeling the cucumber lends to the soft texture of the tartare but save the peels, along with the beet greens, to toss into a smoothie or chop up for use in a salad, just make sure you’re using organic. You can find dry salt-cured olives, also called oil cured, on the olive bar of most nicer grocery stores. The vinaigrette, shallots and tarragon really enhance the flavor of this dish; if you don’t like shallots or tarragon consider replacing them with another, equally flavorful, garnish like capers and dill or thyme. When pressing the tartare into the dish really mash it in well, this helps to press the avocado out to the sides which then acts as a lubricant to help the tartare slide out easily. Taro or other root vegetable chips, assorted crackers or apple slices for serving. 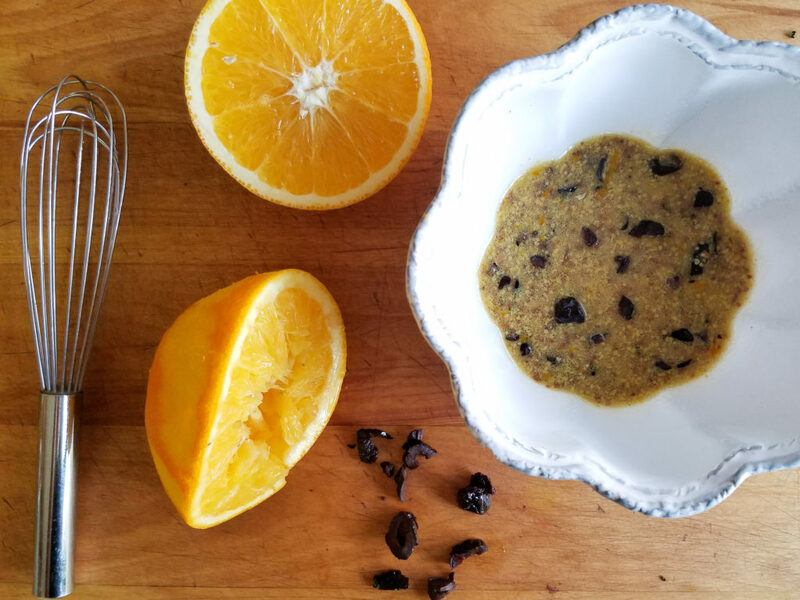 In a small bowl, whisk the mustard, orange juice, zest and olive oil together. Chop the olives into small pieces and stir into the vinaigrette. Set aside. To make the tartare, scoop the avocado into a separate bowl, add the salt and pepper and mash lightly with a fork. 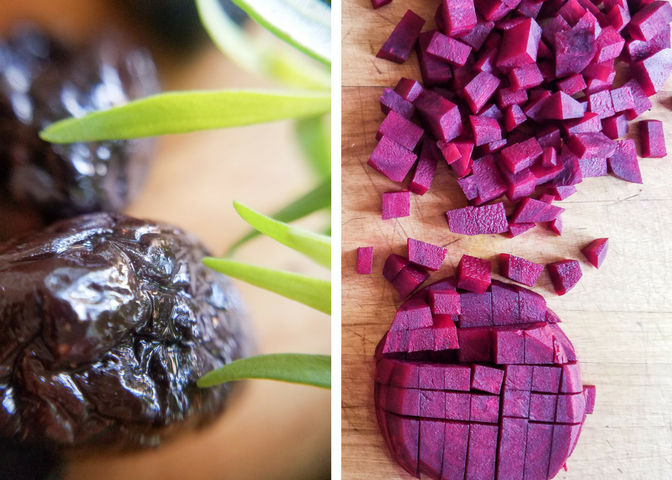 Peel the beets, cucumber and kohlrabi. Slice each into thin rounds, about 1/8 inch thick then stack and cut into tiny cubes. Add the diced vegetables to the avocado and stir well until the avocado is thoroughly incorporated. Taste and add more salt and pepper if desired. Press the mixture into a straight-sided dish to form, run a knife around the edge to separate the tartare from the edge of the dish then invert it onto a serving plate. If any of the mixture remains in the dish gently press it back into place and reshape with a spatula. If you prefer, you can skip the extra dish and pile the mixture onto a serving plate and shape by hand. 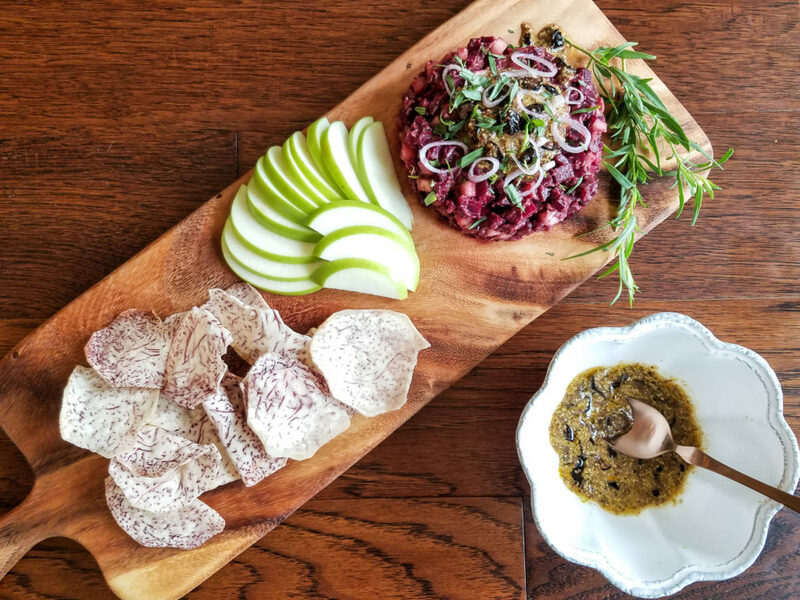 Drizzle the tartare with the vinaigrette and top with a generous amount of sliced shallot and tarragon.